On Feb 8, 2012, as appealed by the Kashag (Tibetan cabinet), Central Tibetan Administration (CTA), Dharamsala, Tibetans in San Francisco and Bay Area assembled at the Chinese Consulate, San Francisco for solidarity candle light vigil. With a candle, I prayed and walked several San Francisco streets along with hundreds of Tibetan fellows, including some non-Tibetan supporters. As you may be aware, a few of the slogans are like clothes I would prefer not to wear on the street (Read my earlier piece on this). While repeating some slogans, I spoke to myself, “We have been doing this for years now. What really came out is a plenty of awareness in the world and a little on the ground in Tibet – the heart of the matter”. After several walks along the streets, the vigil ended at the Chinese Consulate. Standing alone at a corner of the Consulate, I do not want to listen but overheard a nearby conversation among three young Tibetan men. Understandably, they were passionately discussing the Tibetan freedom struggle. One men seems to have some knowledge of China. He shared, “Unlike other super powers, China has a territorial ambition. Sooner or later, China will try to stretch its territorial borders which may end up in conflicts”. While another men curiously shared, “how might it go if Tibetans start bombing China?”. From their conversation, it was clear that young Tibetans are losing patience. 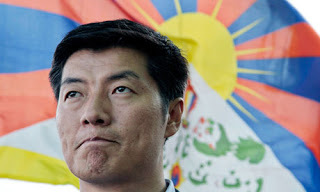 I realized that if the negotiation between Tibetan delegates and China’s United Work Front fails to produce any concrete results for Tibetans in Tibet in the next five or six years, young Tibetans may take a totally different route to resolve Tibet’s problem. Reflecting on a popular advise from His Holiness the Dalai Lama, the CTA may need to “hope for the best but prepare the worst” i.e., if young Tibetans start using violence as an approach towards resolving Tibet’s problem. Among several alternatives, one may be that the CTA starts evaluating or reevaluating different approaches (or policies) towards peacefully resolving Tibet’s problem before it turns violent. Finally, when the crowd was about to disperse, I saw a non-Tibetan lady crying and muttering towards a group near me, “she (a speaker) is saying autonomy for Tibet”. It was little intimidating to see a non-Tibetan crying for Tibet. What the lady said at the end stunned me (if I heard it right). She was talking about using suicide bombers for Tibet. Will suicide bombers do good for resolving Tibet’s problem? My hindsight is, it will do more harm than any good. However, reflecting on earlier conversation among three young Tibetan adults and correlating it with a non-Tibetan lady’s support for violence, I felt the CTA must do something before nothing could stop these peoples from going beyond anyone’s understanding. We can only hope that Tibet’s struggle does not become violent. Violence is not a solution, but civil disobedience (in large numbers) is, as seen in the actions of Mahatma Gandhi and Dr. Martin Luther King. Change must come to Tibet.